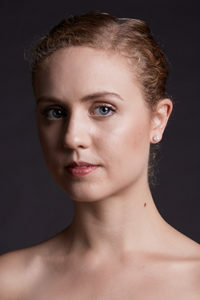 Born in Eugene, Victoria Harvey began her professional ballet training in Portland, Oregon, and continued her studies at the Royal Winnipeg Ballet School Professional Division, graduating in 2007. Now in her 10th season with the Eugene Ballet Company, Victoria has had the pleasure of being featured in several lead roles in Toni Pimble’s ballets such as Daisy Buchanan in The Great Gatsby, Mrs. Walker in Tommy the Ballet, and the Conjure Woman in The Snow Queen. She has also performed in several pieces by guest choreographers including Gerald Arpino’s Light Rain, Gillmer Duran’s Without the Cover, and Septime Webre’s Fluctuating Hemlines. Victoria has brought her theatrical style to roles such as Princess Jasmine in The Nutcracker, Hermia in A Midsummer Night’s Dream, the Russian Dancer and Lead Swan in Swan Lake, the Fairy Godmother in Cinderella, and as the Fairy of Generosity in The Sleeping Beauty. In addition to her work with Eugene Ballet, Victoria is an active member of the dance community in Eugene, teaches ballet and movement to all ages, and is a performer and board member of #instaballet.